Cornbread is a favorite throughout America, though you will find different versions of it in different parts of the country. In the North, where the corn muffin holds the distinction as the official state muffin of Massachusetts, it tends to be sweeter and more cake-like. In the South it tends to have a fuller texture. 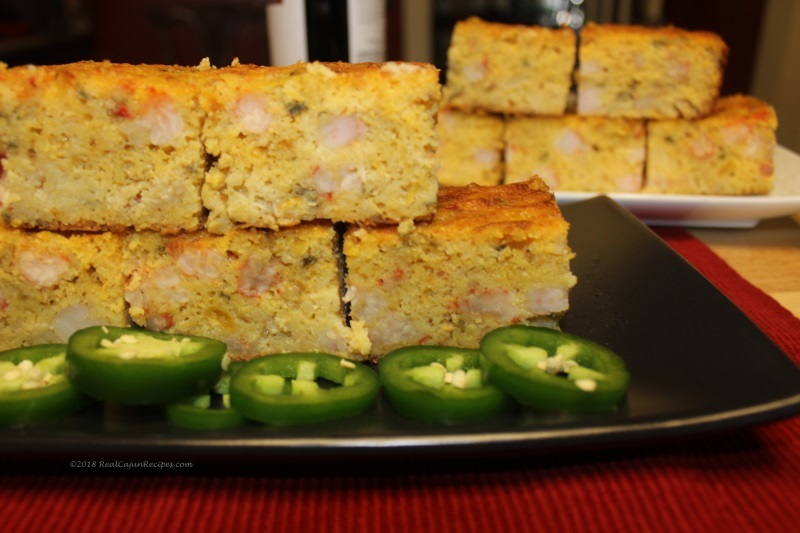 In the Southwest you’ll often find cornbread flavored with chopped chilies and onions. In Cajun Land, they love crawfish, cheese, and pepper among other things. This cornbread may be reheated the next day, uncovered in a 350 degree oven for 10 minutes or until warm throughout. An extra pound of shrimp may be added but the recipes works just fine with the crawfish. Sauté onions and bell pepper in a small amount of butter until the onions are transparent. Add jalapeno peppers and set aside. Mix together all other ingredients, except crawfish. Add in cooked onions and peppers. Then stir in crawfish or meat. Pour into a lightly greased 13x9 inch pan and bake in a 400 degree oven for 35 to 40 minutes.